For other uses, see Cornus (disambiguation). "Dogwood" redirects here. For other uses, see Dogwood (disambiguation). Cornus is a genus of about 30–60 species[Note 1] of woody plants in the family Cornaceae, commonly known as dogwoods, which can generally be distinguished by their blossoms, berries, and distinctive bark. Most are deciduous trees or shrubs, but a few species are nearly herbaceous perennial subshrubs, and a few of the woody species are evergreen. Several species have small heads of inconspicuous flowers surrounded by an involucre of large, typically white petal-like bracts, while others have more open clusters of petal-bearing flowers. The various species of dogwood are native throughout much of temperate and boreal Eurasia and North America, with China and Japan and the southeastern United States particularly rich in native species. 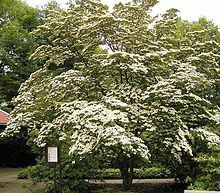 Depending on botanical interpretation, the dogwoods are variously divided into one to nine genera or subgenera; a broadly inclusive genus Cornus is accepted here. The name "dog-tree" entered the English vocabulary before 1548, becoming "dogwood" by 1614. Once the name dogwood was affixed to this kind of tree, it soon acquired a secondary name as the Hound's Tree, while the fruits came to be known as dogberries or houndberries (the latter a name also for the berries of black nightshade, alluding to Hecate's hounds). Another theory advances the view that "dogwood" was derived from the Old English dagwood, from the use of the slender stems of its very hard wood for making "dags" (daggers, skewers, and arrows). Another, earlier name of the dogwood in English is the whipple-tree. Geoffrey Chaucer uses "whippletree" in The Canterbury Tales ("The Knight's Tale", verse 2065) to refer to the dogwood. A whippletree is also an element of the traction of a horse-drawn cart, linking the drawpole of the cart to the harnesses of the horses in file; these items still bear the name of the tree from which they are commonly carved. The fruits of all dogwood species are drupes with one or two seeds, often brightly colorful. The drupes of species in the subgenera Cornus are edible. Many are without much flavor. Cornus kousa and Cornus mas are sold commercially as edible fruit trees. The fruits of Cornus kousa have a sweet, tropical pudding like flavor in addition to hard pits. The fruits of Cornus mas are both tart and sweet when completely ripe. They have been eaten in Eastern Europe for centuries, both as food and medicine to fight colds and flus. They are very high in vitamin C. However, those of species in subgenus Swida are mildly toxic to people, though readily eaten by birds. Dogwoods are widely planted horticulturally, and the dense wood of the larger-stemmed species is valued for certain specialized purposes. Cutting boards and other fine turnings can be made from this fine grained and beautiful wood. Over 32 different varieties of game birds, including quail, feed on the red seeds. Various species of Cornus, particularly the flowering dogwood (Cornus florida), are ubiquitous in American gardens and landscaping; horticulturist Donald Wyman stated, "There is a dogwood for almost every part of the U.S. except the hottest and driest areas". In contrast, in England the lack of sharp winters and hot summers makes Cornus florida very shy of flowering. 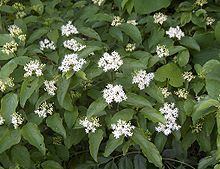 Other Cornus species are stoloniferous shrubs that grow naturally in wet habitats and along waterways. Several of these are used along highways and in naturalizing landscape plantings, especially those species with bright red or bright yellow stems, particularly conspicuous in winter, such as Cornus stolonifera. The species Cornus mas is commonly cultivated in southeastern Europe for its showy, edible berries, that have the color of the carnelian gemstone. Cornelian-cherries have one seed each and are used in syrups and preserves. Dense and fine-grained, dogwood timber has a density of 0.79 and is highly prized for making loom shuttles, tool handles, roller skates and other small items that require a very hard and strong wood. Though it is tough for woodworking, some artisans favor dogwood for small projects such as walking canes, arrow making, mountain dulcimers and fine inlays. Dogwood wood is an excellent substitute for persimmon wood in the heads of certain golf clubs ("woods"). Dogwood lumber is rare in that it is not readily available with any manufacturer and must be cut down by the person(s) wanting to use it. Larger items have also been occasionally made of dogwood, such as the screw-in basket-style wine or fruit presses. The first kinds of laminated tennis rackets were also made from this wood, cut into thin strips. 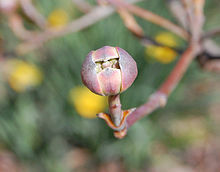 Dogwood twigs were used by U.S. pioneers to brush their teeth. They would peel off the bark, bite the twig and then scrub their teeth. The Japanese cornel, C. officinalis, is used extensively in traditional Chinese medicine as "shān zhū yú" for several minor ailments. The following classification recognizes a single, inclusive genus Cornus, with four subgroups and ten subgenera supported by molecular phylogeny. Geographical ranges as native plants are given below. In addition, cultivated species occasionally persist or spread from plantings beyond their native ranges, but are rarely if ever locally invasive. Subgenus Yinquania. Leaves opposite to subopposite; fall blooming. Cornus peruviana. Costa Rica and Venezuela to Bolivia. Subgenus Kraniopsis. Leaves opposite; summer blooming. Cornus alba[Note 2] (Siberian dogwood). Siberia and northern China. Cornus amomum[Note 3] (silky dogwood). Eastern U.S. east of the Great Plains except for the Deep South. Cornus asperifolia (toughleaf dogwood). Southeastern U.S.
Cornus austrosinensis (South China dogwood). East Asia. Cornus bretschneideri (Bretschneider's dogwood). Northern China. Cornus coreana (Korean dogwood). Northeast Asia. Cornus drummondii (roughleaf dogwood). U.S. between the Appalachia and the Great Plains, and southern Ontario, Canada. Cornus foemina (stiff dogwood) Southeastern and southern United States. Cornus glabrata (brown dogwood or smooth dogwood). Western North America. Cornus hemsleyi (Hemsley's dogwood). Southwest China. Cornus koehneana (Koehne's dogwood). Southwest China. Cornus macrophylla (large-leafed dogwood; Chinese: 梜椋; pinyin: jiáliáng or jiàliáng). East Asia. Cornus obliqua[Note 4] (pale dogwood). Northeastern and central U.S., and southeastern Canada. Cornus racemosa (northern swamp dogwood or gray dogwood). Northeastern and central U.S., and extreme southeastern Canada. Cornus rugosa (round-leaf dogwood). Northeastern and north-central U.S., and southeastern Canada. Cornus sanguinea (common dogwood). Europe. Cornus sericea[Note 5] (red osier dogwood). Northern and western North America, except Arctic regions. Cornus walteri (Walter's dogwood). Central China. Cornus wilsoniana (Wilson's dogwood). Central China. Cornus × arnoldiana (Hybrid: C. obliqua × C. racemosa). Eastern North America. Subgenus Mesomora. Leaves alternate; summer blooming. Cornus alternifolia (pagoda dogwood or alternate-leaf dogwood). Eastern U.S. and southeastern Canada. Cornus controversa (table dogwood). East Asia. Subgenus Afrocrania. Dioecious, bracts 4. Cornus mas (European cornel or Cornelian-cherry). Mediterranean. Cornus officinalis (Japanese cornel). China, Japan, Korea. Cornus sessilis (blackfruit cornel). California. Cornus chinensis (Chinese cornel). China. Subgenus Discocrania. Bracts 4, modified, non-petaloid; fruits oblong, red. Subgenus Cynoxylon. Bracts 4 or 6, large and petaloid, fruits oblong, red. Cornus florida (flowering dogwood). U.S. east of the Great Plains, north to southern Ontario. Cornus nuttallii (Pacific dogwood). Western North America, from British Columbia to California. Subgenus Syncarpea. Bracts 4, large and petaloid, fruits red, fused into a compound multi-stoned berry. Cornus capitata (Himalayan flowering dogwood). Himalaya. Cornus hongkongensis (Hong Kong dogwood). Southern China, Laos, Vietnam. Cornus kousa (Kousa dogwood). Japan and (as subsp. chinensis) central and northern China. Cornus canadensis (Canadian dwarf cornel or bunchberry) Northern North America, southward in the Appalachian and Rocky Mountains. Cornus suecica (Eurasian dwarf cornel or bunchberry). Northern Eurasia, locally in extreme northeast and northwest North America. Cornus × unalaschkensis (Hybrid: C. canadensis × C. suecica). Aleutian Islands (Alaska), Greenland, and Labrador and Newfoundland in Canada. Cornus × rutgersensis (Hybrid: C. florida × C. kousa). Horticulturally developed. The inflorescence ("flower") of the Pacific dogwood (Cornus nuttallii) is the official flower of the province of British Columbia. The flowering dogwood (Cornus florida) and its inflorescence are the state tree and the state flower respectively for the U.S. Commonwealth of Virginia. It is also the state tree of Missouri and the state flower of North Carolina, and the State Memorial Tree of New Jersey. The poet Virgil makes reference to a haunted copse of cornel and myrtle in Book III of the Aeneid. The hero Aeneas attempts to break off boughs to decorate an altar, but instead the wood drips with black blood. Anne Morrow Lindbergh gives a vivid description of the dogwood tree in her poem "Dogwood". A Christian legend of unknown origin proclaims that the cross used to crucify Jesus was constructed of dogwood. As the story goes, during the time of Jesus, the dogwood was larger and stronger than it is today and was the largest tree in the area of Jerusalem. After his crucifixion, Jesus changed the plant to its current form: he shortened it and twisted its branches to assure an end to its use for the construction of crosses. He also transformed its inflorescence into a representation of the crucifixion itself, with the four white bracts cross-shaped representing the four corners of the cross, each bearing a rusty indentation as of a nail, the red stamens of the flower representing Jesus' crown of thorns, and the clustered red fruit representing his blood. In the Victorian era, flowers or sprigs of dogwood were presented to unmarried women by male suitors to signify affection. The returning of the flower conveyed indifference on the part of the woman; if she kept it, it became a sign of mutual interest. The term "dogwood winter", in colloquial use in the American Southeast, is sometimes used to describe a cold snap in spring, presumably because farmers believed it was not safe to plant their crops until after the dogwoods blossomed. ^ Cornus sericea, treated separately here, is sometimes included in a more broadly taken concept of Cornus alba, which in that sense is also native in North America. ^ Cornus obliqua, here recognized separately, has been included in a broader concept of C. amomum by some botanists. Canadian reports for C. amomum are apparently all based on plants here classified as C. obliqua. ^ Cornus obliqua is sometimes included in a more broadly taken concept of C. amomum, also in the eastern U.S.
^ Cornus sericea (including C. stolonifera) is sometimes itself included in a more broadly taken concept of the otherwise Eurasian Cornus alba. ^ Atkinson, Brian A.; Stockey, Ruth A.; Rothwell, Gar W. (2016). "Cretaceous origin of dogwoods: an anatomically preserved Cornus (Cornaceae) fruit from the Campanian of Vancouver Island". PeerJ. 4: e2808. doi:10.7717/peerj.2808. PMC 5180587. PMID 28028474. ^ Qiu-Yun (Jenny) Xiang; David T. Thomas; Wenheng Zhang; Steven R. Manchester & Zack Murrell (2006). "Species level phylogeny of the genus Cornus (Cornaceae) based on molecular and morphological evidence – implications for taxonomy and Tertiary intercontinental migration". Taxon. 55 (1): 9–30. doi:10.2307/25065525. JSTOR 25065525. ^ "Notable Characteristics of Dogwood Trees". answers.com. Archived from the original on August 26, 2014. Retrieved August 24, 2014. ^ Vedel, H., & Lange, J. (1960). Trees and Bushes in Wood and Hedgerow. Metheun & Co. Ltd., London. ^ Fernald, Merritt Lyndon (1950). Gray's Manual of Botany (8th ed.). New York: American Book Company. ^ "Wildlife Dogwood Trees". Prepper Gardens. Archived from the original on 2013-11-16. Retrieved January 8, 2013. ^ Wyman's Garden Encyclopedia, s.v. "Cornus"
^ Alice M. Coats, Garden Shrubs and their Histories (1964) 1992, s.v. "Cornus". ^ "AGM Plants - Ornamental" (PDF). Royal Horticultural Society. July 2017. p. 16. Retrieved 24 January 2018. ^ "RHS Plantfinder - Cornus 'Eddie's White Wonder'". Retrieved 2 February 2018. ^ "RHS Plantfinder - Cornus 'Norman Hadden'". Retrieved 2 February 2018. ^ "RHS Plantfinder - Cornus 'Ormonde'". Retrieved 2 February 2018. ^ "RHS Plantfinder - Cornus 'Porlock'". Retrieved 2 February 2018. ^ "Dogwood." McGraw-Hill Concise Encyclopedia of Science and Technology. New York: McGraw-Hill, 2006. Credo Reference. Web. 17 September 2012. ^ Gunn, John C. (1835). Gunn's Domestic Medicine (4th ed.). p. 523. ^ "Dogwood or cornel." The Columbia Encyclopedia. New York: Columbia University Press, 2008. Credo Reference. Web. 17 September 2012. ^ "Medicinal Dogwood Trees". Prepper Gardens. Archived from the original on 2013-11-16. Retrieved January 8, 2013. ^ Schafer, Peg (2011). The Chinese Medicinal Herb Farm: A Cultivator's Guide to Small-scale Organic Herb Production. Chelsea Green Publishing. pp. 312 (page 150). ISBN 9781603583305. ^ Richard H. Eyde (1987). "The case for keeping Cornus in the broad Linnaean sense". Systematic Botany. 12 (4): 505–518. doi:10.2307/2418886. JSTOR 2418886. ^ Richard H. Eyde (1988). "Comprehending Cornus: puzzles and progress in the systematics of the dogwoods". Botanical Review. 54 (3): 233–351. doi:10.1007/bf02868985. JSTOR 4354115. ^ Fan, Chuanzhu; Xiang, Qiu-Yun (2001). "Phylogenetic relationships within Cornus (Cornaceae) based on 26S rDNA sequences". American Journal of Botany. 88 (6). doi:10.2307/2657096. ^ Zhiang, Qiu-Yun; Thomas, David T.; Zhang, Wenheng; Manchester, Steven R.; Murrell, Zack (2006). "Species level phylogeny of the genus Cornus (Cornaceae) based on molecular and morphological evidence—implications for taxonomy and Tertiary intercontinental migration" (PDF). Taxon. 55 (1). Retrieved 29 January 2016. ^ Nowicki, Marcin; Boggess, Sarah L.; Saxton, Arnold M.; Hadziabdic, Denita; Xiang, Qiu-Yun Jenny; Molnar, Thomas; Huff, Matthew L.; Staton, Margaret E.; Zhao, Yichen (2018-10-23). Heinze, Berthold (ed.). "Haplotyping of Cornus florida and C. kousa chloroplasts: Insights into species-level differences and patterns of plastic DNA variation in cultivars". PLOS ONE. 13 (10): e0205407. doi:10.1371/journal.pone.0205407. ISSN 1932-6203. PMC 6198962. PMID 30352068. ^ "Tropicos | Name - Cornus peruviana J.F. Macbr". www.tropicos.org. Retrieved 2016-01-29. ^ Macbride, J.F. (1959). "Cornaceae". Flora of Peru. 13 pt.5 no.1. Field Museum. pp. 44–45. ^ Manchester, S.R. (1994). "Fruits and Seeds of the Middle Eocene Nut Beds Flora, Clarno Formation, Oregon". Palaeontographica Americana. 58: 30–31. ^ "Cornus florida × Cornus kousa". Landscape Plants: Images, identification, and information. Oregon State University. Retrieved 20 May 2011. ^ Aeneid III 22-23: Forte fuit iuxta tumulus, quo cornea summo virgulta et densis hastilibus horrida myrtus. ^ Morrow, Anne (1956). Dogwood. 333 6th Avenue, New York 14, N.Y.: Pantheon Books. pp. 38–39. ^ Jeffrey G. Meyer (2004). The Tree Book: A Practical Guide to Selecting and Maintaining the Best Trees for Your Yard and Garden. Simon and Schuster. pp. 258–. ISBN 978-0-7432-4974-4. ^ Thomas E. Barden (1991). Virginia Folk Legends. University of Virginia Press. pp. 61–. ISBN 978-0-8139-1335-3. ^ Ronald L. Baker (1 August 1984). Hoosier Folk Legends. Indiana University Press. pp. 7–. ISBN 0-253-20334-1. 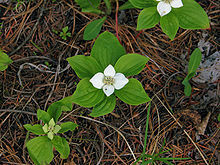 Wikimedia Commons has media related to Cornus. This page was last edited on 26 February 2019, at 12:50 (UTC).